East Finchley is a part of a not very significant place. You can tell that from the shape of it. Finchley started off as an appendage of the Bishop of London's Fulham estate. It was then administered as part of Hornsey. Late in the day it gained independence fleetingly first as an Urban District, then a Borough before losing out to become part of the London Borough of Barnet. Finchley itself was composed of several settlements and to this day most people in East Finchley are proud to belong to that small community. Below is my history of the area. This account started as a history series for the local newspaper, The Archer. I have also attached to this page copies of one or two talks I have given on local history. 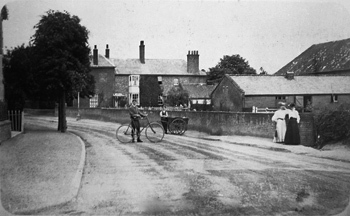 Most of the historical photos on this site are courtesy of the Finchley Society. Sources of information are given at the bottom of the page. See also some nuggets of local history collected here. The unique terrain of Finchley owes much to the Anglian Ice Age, which pushed south about half a million years ago, stopping just a little to the south of us. It is best explained in conjunction with the British Geological Survey Map. Opening the map your attention is caught by a light blue triangle, the Finchley triangle, sitting in the midst of the surrounding brown clay. Fortis Green, East End Road and Ballards Lane run along southern and north western sides of this triangle at a fairly regular height of 90 to 95 metres but the triangle dips down toward the north east, to where the High Roads of East and North Finchley meet the North Circular Road. The light blue represents a unique surface layer of chalky, sandy clay, pushed down from the north and deposited when the icecap melted. Under this clay, in a hollow in the base clay of the region, lies a “filling” of Dollis Hill gravel, probably deposited by a major tributary flowing north to join the Thames, then flowing through Watford. The ice cap blocked these northern routes, forming enormous lakes, and diverted the Thames, originally flowing north-west to the Wash, through London on its current course. The gravel “filling” has acted as a reservoir ever since, excess rain water flowing over the join between gravel and clay in numerous streams, noticeably to the north east, to join Pymm’s Brook and the River Lea. The steep southern and north western sides drain westward, the Dollis Brook and Mutton Brook joining to form the Brent Brook which flows backward along the earlier river course. The topography of this triangle has played a key part in the history and development of Finchley as a whole. When settlements first started to appear, the clayey and patchy nature of the ground led to distributed settlements, the well drained south and west slopes being especially favoured. Acknowledgements: British Geological Survey, London & The Thames Valley, 1996 edition. An attractive feature of East Finchley today is its closeness to woodland, remnants of a much earlier extensive covering. Following the retreat of the icecap the Finchley triangle was re-colonised by plants, animals and finally man. Early man would have found the area forested and difficult and there is nothing to suggest any clearing might have taken place before 5000 BCE. Early travellers left evidence of passage, from early stone age flint tools in the centre of the triangle, to late stone age flints around Muswell Hill but there is no evidence of any settlement. The Romans visited the area too, leaving coins and pottery quite close by. The Romans usually avoided the hilly northern heights, constructing straight roads in the valleys either side, Watling Street and Ermine Street, known today as the Edgware Road and Tottenham High Road. Even when the Romans left, the roads they left behind remained in use and most people had very little reason to venture into the woods covering Finchley. The nearest track way was probably the early route of Hampstead Lane, before it was diverted away from Kenwood House, and which formed Finchley’s southernmost boundary. Then came the Saxons up the River Thames to settle in its valleys. These middle Saxons were a loose group of tribes, dominated in turn by the Kingdoms of Essex, Mercia and Wessex. The name Finchley - clearing with finches - owes its name to them. King Alfred’s son Edward introduced the counties of Middlesex and Hertfordshire about 900 CE as a defence against the Danes, and the middle Saxons were divided between them; the area now known as Finchley forming the northern border of Middlesex. The Bishops Avenue and The Bishops Wood are the last reminders of the Bishops of London, Finchley’s remote landlords for almost one thousand years. It was King Ethelbert of Kent, having married a French Christian in around 600, who set about reconverting Britain. After installing Augustine in Canterbury he set up an enormous diocese of St Paul in London, based on his reluctant nephew’s Essex kingdom. To fund its activities he endowed it with the estate of Stepney. A hundred years later, after initial setbacks, Fulham was added. The impenetrable northern heights belonged to these estates, Finchley to Fulham and Hornsey to Stepney. As such they do not get specific mention in the Domesday Book. Their boundaries were determined by the boundaries of more important neighbouring estates - Hendon, Hampstead, Tottenhall and so on. They were based on landmarks such as the Dollis and Mutton Brooks, and the ancient track just south of the present Hampstead Lane. Travellers northward from Finchley enter Hertfordshire and then re-enter Middlesex. This is because the land of the upper Pymms Brook, down as far as Bettstyle (the blue circle), was given to the monks of St Albans before the administrative boundaries were defined. Because the Bishops owned both Finchley and Hornsey, the shared boundary wasn’t formalised until 1738. By the 1200’s the Bishops had established a hunting park of 1070 acres across the south of this combined property, with access from the south, stretching from the present day Spaniards in the west, to Highgate Gatehouse in the east and East Finchley to the north, with gates at these extremities. Turners Wood, Bishops Wood and Highgate Wood are vestiges of this park, which was bordered by a ditch and hedge to keep the deer in (park of this hedge is thought to remain in the corner of Lyttleton Playing Fields) and there was a hunting lodge (marked on the map by a green rectangle), visited by kings, in the centre. The Hunting Park, sometimes known as Hornsey Park) ceased to be used as such in the 1500’s, although the moat remaining from the lodge is marked on the 1895 ordnance survey map “Kenwood and Golders Green” . Finchley was firmly on the map by 1199 when King John exempted the Bishop and his tenants within his domain of Finchley from the payment of various taxes. Original access to the heavily wooded Finchley triangle was probably from Hendon, a small settlement originating at the bottom left corner, sufficiently above the Dollis Brook to avoid flooding. At some time the church was built. Originally the dense woodland on clay soil yielded wood products - timber and charcoal - and foraging for pigs. As the area was cleared eastwards from this settlement early routes hugging the two main sides of the Finchley triangle. Cleared land yielded to grazing sheep and hay production. To administer the land a manor house was built, part way between the original settlement, the church end, and the east end, on the high ground hugging route we now call East End Road which linked the easiest and choicest areas for exploitation. The tenancy of the manor by the wealthy Adam de Basing, Tailor and Chief Financier to Henry III, probably accelerated the clearance. Scattered settlements appeared along East End Road, collectively known as East End. Access to water from the shallow gravel layer allowed many cottages to have their own well. The gravel seams exposed by the south facing slopes of Mutton Brook, would have been attractive for crops. Small settlements grew up along the winding track at the edge of the common, including Cuckolds Haven and Fallow Corner, presumably housing many copy holders, those with rights to make use of the common. For centuries, Finchley remained an unremarkable rural community whose dependence on wood based occupations gradually gave way to pasturing, hay making and servicing the basic needs of London. Population never rose much above 250 households at the best of times. Then, around 1820, several factors coincided which were to change the face of East Finchley beyond recognition. The enclosure of the common, the growth and dominance of London, and improvements in transport each contributed and will be explored in more detail in later chapters. A hint of the change is just evident on the 1821 Ordnance Survey map which shows the new development of land around present day Barclays Bank. London’s growth statistics were phenomenal and fuelled by an influx of newcomers. In fact, for most of its history, London’s deaths exceeded its birth rate. Between 1500 and 1650 population increased tenfold, overflowing boundaries and joining Westminster. By 1700 London surpassed even Paris. Speculative development between landowner and builder, with the builder taking the risk, enabled a house building boom which spread across the Euston Road around 1800, reaching Highgate within 50 years and East Finchley soon after. The expansion was assisted by the development of the horse drawn omnibus and the railway (1830’s), horse tram (1870’s), electric tram (1890’s) and underground (1900’s). The 1860 Cheap Trains Act introduced the cheap workman’s fare at times outside the normal middle class day and led to the speculative development of lower cost housing at about the time that East Finchley became ripe for development. The more affluent classes were always able to travel that bit faster and further, arriving first, but as areas became over developed, they moved on, their properties subsequently torn down and replaced by individually cheaper but much higher density housing. Nowhere is this more evident than in East Finchley. Until the early 1800s the only C of E church in Finchley was the original St Mary at Finchley almost two miles walk away from the East End community, quite a hike each week for the inhabitants of East Finchley. A church school was also set up there in 1813 in response to Methodists introducing teaching at their chapel. History was to repeat itself. The Congregationalists were known to be active in East Finchley by 1804 and by 1830 they had built a chapel on the edge of Finchley common, facing the Great North Road (enlarged in 1846.) In 1842 they started a school, a British school, at the chapel. This draw on their members prompted C of E goers to raise funds for a local church and school in East Finchley, which they did. 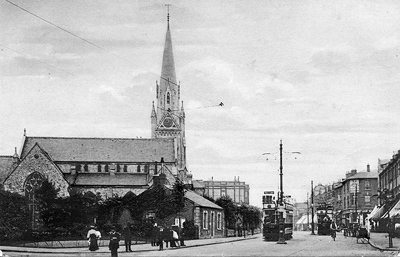 Holy Trinity church was built in Bull Lane in 1846, the lane being renamed Church Lane. Holy Trinity School was founded by the parish church in 1847 under the aegis of The National Society for the Education of the Poor in the Principles of the Established Church (thus it was a National school) . It included an “Industrial School”, where pupils were trained in various aspects of agriculture or domestic service. It housed 240 pupils. After a fire at the British School in 1875 the Congregationalists pushed for a school board to take over. This was done in 1881, and as a result their school was replaced by a new board school, in 1884 for 500 boys and girls and 250 infants. Later named Alder School, it became a secondary school, younger pupils being reassigned to a new council school in 1913 renamed Martin School. Meanwhile the Congregationalists had already moved on into a tall graceful church building at the intersection of EER and the High Road until, sadly, now replaced by Viceroy Parade. The first wave of London expansion to hit EF, in the 1800’s, was to prove short lived. Where elegant houses were to stand in capacious grounds, the memories now live on only in street names. The most notable property, dating from the 1600’s but considerably extended in this period, was Elm House, almost opposite the Five Bells. Its most celebrated occupant was Anthony Salvin, an architect of national renown, whose restorations included Alnwick and Norwich Castles, parts of the Tower, and Thoresby Hall. Salvin and his family were largely responsible for the construction of EF’s parish church of Holy Trinity and the village school on East End Road in the 1840’s. Elm House, later renamed Elmhurst, survived until the war. Part of the property is now a green space. Another occupant was Samuel Pulham, a Mayor of Finchley, and it his name, rather than Salvin’s which has been remembered. Salvin is remembered indirectly in Springcroft Avenue, as we shall see in a later chapter. Further along East end Road was Park Farm, later used by George Sanger to winter his circus animals until his murder there in 1911. Between there and Elmhurst was Knightons, opposite Church Lane, and the only surviving building of the period, Fairacres. Between Elmhurst and the Vicarage (Cedar Drive) were some smaller properties and one Cromwell Hall, set back a little down the slope in large grounds. To my untrained eye, parts of Church Lane and Fortis Green remain the most varied and attractive parts of the area. Development of Fortis Green from a countryside track began with the enclosure of the commons it crossed. The area of Hornsey Common fronting the track was divided into narrow plots and used to commute the Common’s copyholder’s rights in 1815. Building started soon after, effectively augmenting the hamlet of Fortis Green around the Clissold Arms. Meanwhile development from the EF end began in 1820 when the Bishop sold off a large south facing field on the Barclay’s Bank corner for development. Known collectively as Park Place there were four grand houses and numbering from the High Road these were Fairlawn, Cranleigh, Park Hall and Summerlee respectively. Then, in 1835, just across the border in Hornsey, architect and EF resident Anthony Salvin and his brother in law purchased a field and built two elegant Italianate villas Springcroft and Colethall (later Uplands), the latter being featured in Gardener’s Magazine at the time. Development of the adjacent plot, behind older houses on Fortis Green, to be known as the Harwell Estate, began in 1853 and marks the transition toward the methods which were to be used subsequently for the development of all EF’s remaining open spaces. The estate was laid out with roads and divided into small plots for sale in blocks to local builders for speculative ventures. Starting before the advent of the railway, development proved slow and piecemeal, which is why this estate has such a wide variety of architectural styles. At that time, Southern Road went nowhere and even today you can see the irregular joins at each end. Sometimes several plots were purchased for one dwelling (see Beechwood); some of the plots in Southern Road have since been turned round to front Eastern and Western Roads. The coming of the railway in 1867 increased the pressure for smaller properties, but that’s another story. Acknowledgements: The Growth of Muswell Hill by Jack Whitehead. Contrary to popular belief, the Common never belonged to the commoner. In Finchley’s case the common was the waste of the Manor of Finchley and as such belonged to the Bishop of London and was regulated by the Bishops Court. Commoners could apply for rights to graze, cut timber or remove earth, or to erect a dwelling in return for a payment, known as a fine. As evidence of their rights, the successful commoners were given a copy of the court roll and were known as copyholders. Nevertheless a gradual unofficial encroachment went on by all and sundry. A common practice was for sheep to be stationed on the common during the hay season and returned to the hayfield after the crop was harvested. Parts of the common were also used in emergencies to “house” those fleeing London during the plague or for exercising troops at times of war. Land around London gained in value as London expanded, and this made enclosure, the process whereby the land was parcelled out to individuals, subject to meeting certain conditions, gradually more desirable. All interested parties usually had a right to some compensation, whether it was the allocation of a piece of the land, or the tenure of a dwelling built on the land of another. In the case of Finchley Common enclosure was already in progress from 1760 onwards and on 4th April 1811 an act for ‘inclosing land in the Parish of Finchley’ was introduced into the Commons such that in 1816 (a year after neighbouring Hornsey) the rest was enclosed. In the apportionment, 15% of the land went to defray expenses (including to the Regents Canal Company for a reservoir), the Rector of Finchley then received 13% (in lieu of glebe and tithe), Thomas Allen 11%, the Bishop received 5%, and the rest was divided proportionately among the freeholders, copyholders, and lessees. The largest allotments were to John Bacon (10%), the Marquess of Buckingham (5%), Sir William Curtis (4%), Alexander Murray as lessee of Bibwell (2.8%), and the Earl of Mansfield as lessee of the demesne woods (2%). Large parcels of land were subsequently sold off for development of one kind or another, from housing to cemeteries to country estates and had a large impact on the future of East Finchley. When first opening an old map of Finchley I was surprised to see the railway marked as the “Edgware Line” not the “Barnet Line”. Was this the mistake it seemed? London’s first railway was opened in February 1836, between Deptford and Bermondsey. Main lines soon followed and the Great Northern Railway opened into Kings Cross in 1852. The 1850’s and 60’s saw the construction of most of London’s network of suburban railways, including, in 1867, the Highgate and Edgware Railway, connecting to the GNR at what is now Finsbury Park, and subsequently bought up by them. Ongoing trains took commuters on to Kings Cross and Moorgate. Double tracks, initially to Highgate, were extended to Finchley, [Church End] when, in 1872, a double track branch line was added from Church End to High Barnet. A year later, a further branch was opened from Highgate to serve the newly constructed Alexandra Palace, with an intermediate station at Muswell Hill. A shilling return fare from Kings Cross included admission. Within 16 days of opening the palace was burned down with loss of 3 lives, but fortunately for the railway a second palace opened two years later. As the surrounding countryside was built over, additional stations were built at Stroud Green (1881), Cranley Gardens (c.1905), the Hale (1906), and West Finchley (1933). Traffic grew and with time the single track to Edgware and the bottle neck into Kings Cross became an embarrassment. From 1874 some services were rerouted into North London Railway’s Broad Street via a connection at Canonbury but the problems persisted. Then came a possible solution to all the line’s problems. In 1933 the Government formed the London Passenger Transport Board with powers and funds for a Londonwide programme of New Works. The proposals included a thorough electrification programme, conversion of the remaining single track from Finchley to Edgware to double, extended to Bushey, and to overcome the bottlenecks, new links to the Underground via Highgate and to Moorgate via the Metropolitan Railway at Finsbury Park. Work started in earnest but then the War intervened. In 1870, London’s first underground tube railway ran under the Thames from Tower Hill to Pickleherring Street. Driven by cable, it was a technical triumph but a financial failure. In 1883 some plans were revived to build a line from Borough to King William Street. Eventually, in 1890, this opened from Stockwell to King William Street as the City & South London Railway after a last minute switch to electric traction made it the world’s first underground electric tube railway. [Previous London lines were steam and in tunnels]. This spawned a rush of applications for new lines including the Waterloo & City [open 1898], the ‘Central’ [open 1900] and the Great Northern & City , built to relieve the Great Northern’s suburban bottleneck with a line from Finsbury Park to Moorgate Street. Other schemes were less fortunate in getting finance until American Charles Tyson Yerkes bought them up and injected American capital and equipment. One of these was the Charing Cross, Euston and Hampstead Railway. It had a branch to the Midland railway at Kentish Town - catchment was everything, the more railways or busy bus routes you could tap into the greater the chance of success. In 1902 Yerkes successfully applied for powers to extend the branch to connect with the railway at Highgate while the Hampstead end was extended to Golders Green, allowing access for a depot above ground. The other lines would become the Bakerloo and Piccadilly. Yerkes held these and the tunnel railways (District and Metropolitan District) that he had purchased for electrification through a holding company, the Underground Electric Railways of London (UERL). The CCEHR opened on 1907, although the route north of Archway was not proceeded with. Meanwhile, in 1901 the C&SLR had been extended north to Angel, rerouting from Borough to tap into London Bridge Station and eliminate unsatisfactory gradients at KWS, and thence to Euston in 1907. When Yerkes acquired the C&SLR (and the ‘Central’ line) in 1913 he planned a junction to the CCE&HR at Camden Town. This involved replacement of all 22,000 C&SLR tunnel rings by a wider bore to allow the use of standard rolling stock. The first through trains ran between Moorgate and Hendon in 1924, although the joint line was not called “Northern” until 1937. The link under the Thames from Charing Cross to Kennington was opened in 1926, as was an extension from Clapham to Morden. At the turn of the century, when much of East Finchley’s corner of the Finchley triangle was built or projected, southward across the valley of the Mutton Brook remained mostly rural. The left bank at the bottom of the valley, Saxon Bleccanham, had belonged to Westminster Abbey, along with the rest of Hendon, since the Norman conquest. When he dissolved the monasteries, Henry 8 gave the easternmost land to Eton College, founded by his grandfather. This land became Wyldes Farm. The imminent arrival of the Charing Cross, Euston and Hampstead Railway in Golders Green with its station at North End precipitated Henrietta Barnett into a bid to protect the area adjacent to her home at Spaniards End from piecemeal development. Through the Heath Extension Council she attempted to raise the money to purchase 80 acres from the College for the Heath. Initial donations were not promising and Henrietta enlarged her plan. By purchasing the whole estate the further 243 acres could be developed as an enlightened housing experiment, using the Heath Extension as an amenity on its doorstep. The Barnetts were philanthropists who believed that rich and poor could live together in harmony if only the right surroundings could be provided, and here was the chance to prove it in conjunction with a similarly enlightened LCC. By siting large expensive properties close to the extension, maximising their value, the profits could be used to subsidise the higher density workers’ properties at the lower value end of the site. Even with large LCC contributions, finance was tight and the project was only saved by allowing additional housing to be built on the borders of the Extension. Contacts were signed in Spring 1907. The garden style of development, initiated by enlightened Quaker industrialists was already in vogue. New Earswick (York) and Letchworth Garden City were to be a major influence and Raymond Unwin, site architect, had been involved at both. Careful attention was to be paid to all aspects of design and layout. A bill was passed through parliament to exempt the suburb from some of Hendon’s planning regulations, allowing some narrower roads and a more village type atmosphere. The posh settlement was built around a square on the highest point with fine churches and an institute and Sir Edwin Lutyens was commissioned to design the more formal buildings. The artisan quarter was round the back at Temple Fortune. Almost before the ink was dry on the original contract for Hampstead Garden Suburb changes were afoot. The Garden Suburb Development Company was formed by the Trust to assist the design and let contracts for the construction of houses and other features. Concentrating on the posher areas it was successful for a time, but was eventually disbanded. The other development companies were companies in which tenants participated, making an initial investment of £5 and a commitment to a further £5. This requirement, combined with spiralling land costs, effectively ruled out the original intention to provide homes for the poor and rich alike. These companies were known collectively as the Co-Partners. The original plans for a rural layout based on informal curves started to give way to a more formal structure at the centre, possibly due to the influence of Edwin Lutyens, the architect for the Central Square. Lutyens had differences with Henrietta Barnett over style. He favoured Italianate architecture for the church buildings whereas Barnett wanted Gothic. The result proved a unique but successful compromise. Lutyens was eventually squeezed out before completing all his original brief. The North Square shows great attention to detail. The arch, the arrangement of windows for rooms in the roof, the continuation of the cornice line on the buildings descending Erskine Hill are good examples. Before Central Square was complete the HGS Trust acquired from the Ecclesiastical Commissioners a lease on land in neighbouring Finchley, stretching from here down the hill to the Mutton Brook. This included Little and Big Woods, opened to the public, although it would appear Big Wood was clipped to make way for the fan-shaped extension of the formal layout eastwards. The Co-Partners negotiated a lease on most of the remaining rural land up the valley, to the Bishop’s Avenue and the houses on East End Road. Subsequently the Trust sold many of its rights on the Finchley land to the Co-Partners, including the right to use the name Hampstead Garden Suburb. The relaxing of control and the increasingly commercial stance of the Co-Partners meant that the Finchley part of the Suburb, the largest in area, lacks some of the charm and individuality of the original. Some sources of publications: East Finchley Library, Muswell Hill Bookshop, Hampstead Museum (Burgh House), Church Farm House Museum (Hendon), Dillons Bookshop. Credit goes to The Finchley Society for most of the historical photos on this site. Note: This lists the key sources of information and inspiration which made the articles possible, and a deep debt of gratitude to the authors and publishers is acknowledged. Click here for on line access to Victoria County History Middlesex volume 6, the volume that covers Finchley and Friern Barnet.